Pomegranate molasses is a thick, syrupy pomegranate juice reduction that has a rich, tart flavor with a slightly sweet edge. It can be found in Middle Eastern markets and some gourmet markets. You can substitute Pomegranite juice (like Pom brand). Whisk together the pomegranate molasses, vinegar, mustard, honey and salt and pepper in a medium bowl. Slowly whisk in the olive oil until emulsified. 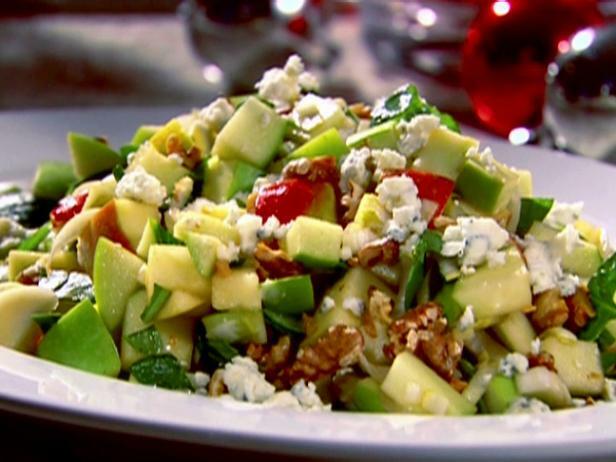 Combine the apples, spinach, endive, walnuts and blue cheese in a large bowl. Add the vinaigrette and toss to coat, season with salt and pepper, to taste.